Ashland 4: There’s Goldoni in those hills! Above: Truffaldino, the servant of two masters (Mark Bedard), takes a break from his dizzying existence. 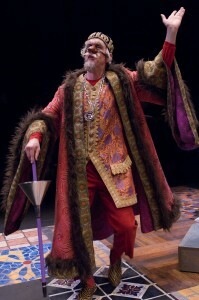 Inset below: The old tightwad Pantalone (David Kelly) is overjoyed at the prospect of receiving more gold. Photos: Jenny Graham/Oregon Shakespeare Festival/2009. Every season at the Oregon Shakespeare Festival needs its lark, that well-turned show of comic wordplay that, while it may or may not also have more serious things on its mind, celebrates the wit and technique and sheer fun of the theater itself. 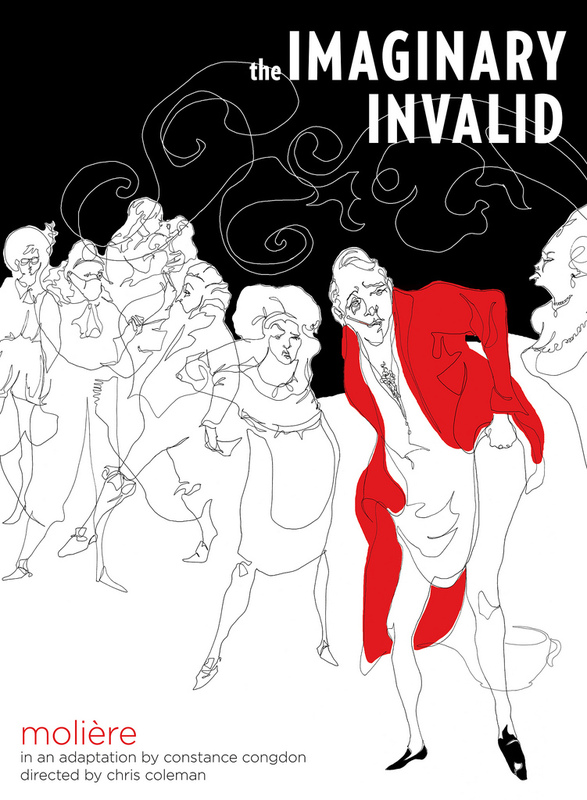 From the old days of Wild Oats and The Shoemaker’s Holiday and Taking Steps to the more recent likes of On the Razzle and The Philanderer and The Further Adventures of Hedda Gabler, the festival has long delighted, and delighted its audience, in theatrical self-reference. Such plays speak to the magical duality of theater, and of art in general: It is of utmost seriousness, and of little consequence. The ability to defend and revel in its inconsequence is a matter of importance in a human society that is constantly expanding and shrinking its limits of permitted expression. In a culture where power calls the shots, the liberating qualities of comedy, which so often crumbles deceits beneath the prodding thumb of ridicule, can be more dangerous than tragedy. Then again, maybe it’s all just fun. This season’s lark is The Servant of Two Masters, the 18th century Italian comedian Carlo Goldoni‘s own masterwork, in a world-premiere adaptation by Oded Gross and director Tracy Young from a literal translation by Beatrice Basso. It is, quite simply, more fun than a barrel of monkeys. 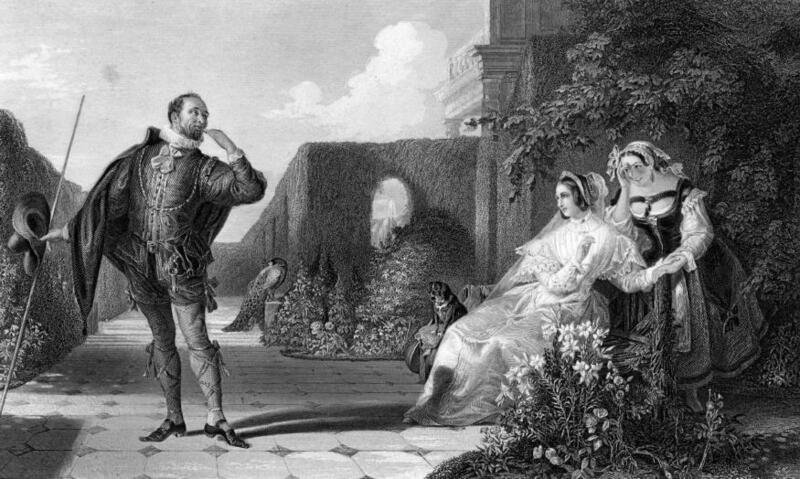 Goldoni, who began his career in Venice and moved on to Paris in disgust over the state of theater in Italy, approached the old Italian form of commedia dell’arte through the prism of the French master Moliere and looked ahead to the 20th century collaborations of Dario Fo and Franca Rame. What he achieved was a marvel of comic construction that is at once as tight as a well-tuned drum and as loose as a good jazz improvisation. Commedia is essentially a form of street theater, with stock characters who are familiar to the audience and who play to form but vary the details to fit the time and place. 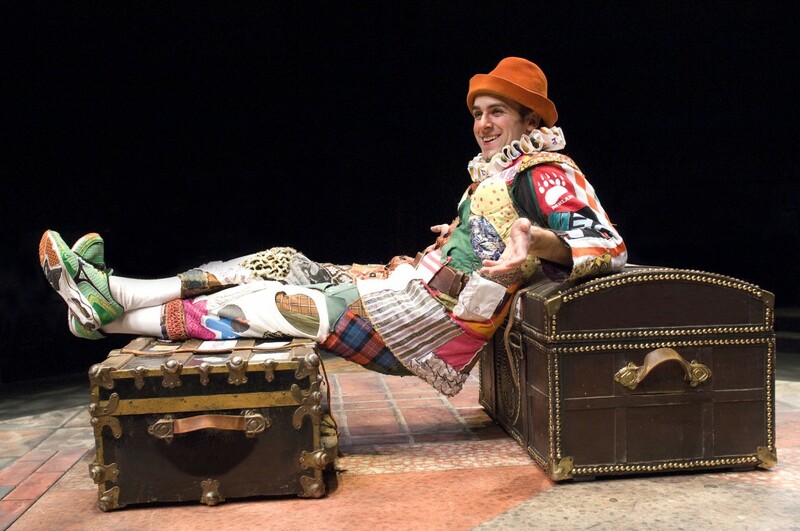 Thus commedia was always traditional and always as fresh as a daily scandal sheet. 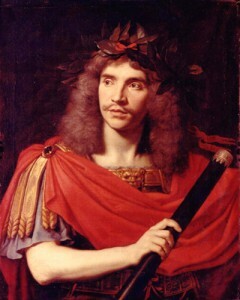 Moliere took the form and translated it into literature. Fo and Rame kept the literary qualities but took things back (at least metaphorically) to the streets. You can’t be this loose on stage without first being tight (no, that’s not a reference to drinking in the rehearsal hall), and this show is a marvel of collaborative craftsmanship. The language is quick and sharp and from the front of the mouth; the action is fleet and sure-footed; the shtick is rigorously rehearsed; the stylized flourishes are easy and exaggerated; the whole thing roars by like a paisley toy locomotive. Topping off the joy of this Servant of Two Masters and letting it take flight is what theater folk call “breaking down the fourth wall” and civilians call simply “playing with the audience.” Bedard and others banter with people in the crowd, cadge candy and sandwiches, flirt, mock, sit down and chat. Pretty soon the audience is shouting back at the actors, hissing, crying out warnings and suggestions, and generally laughing like hyenas in a room full of helium. You just don’t see that sort of thing in Macbeth. Even when the witches — pretty stock characters, themselves — are cackling their silly incantations over their smelly stewpot. 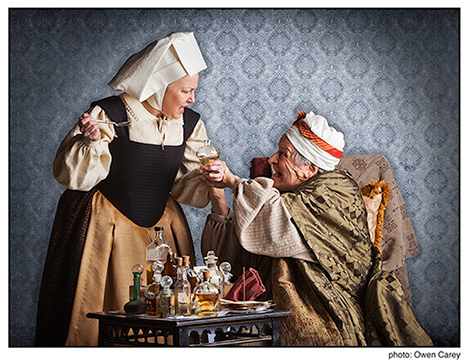 Clarice (Kjerstine Rose Anderson) and Beatrice (Kate Mulligan), disguised as Federigo, come to a new understanding. 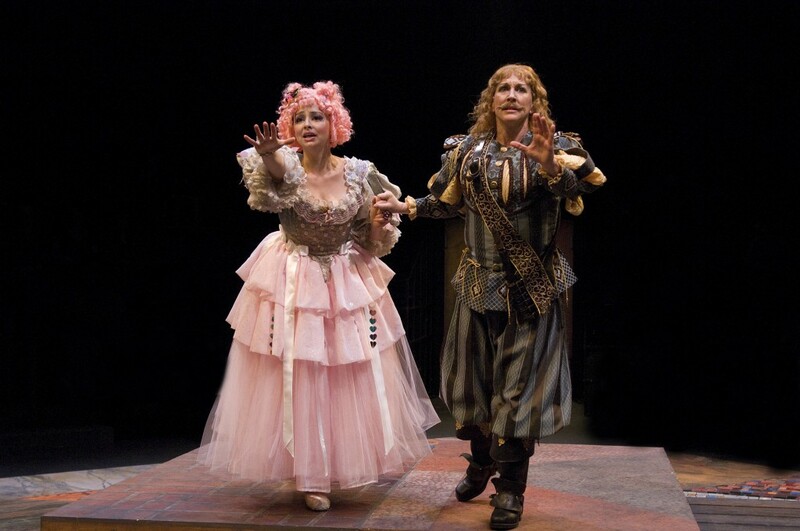 Photo: Jenny Graham/Oregon Shakespeare Festival/2009.